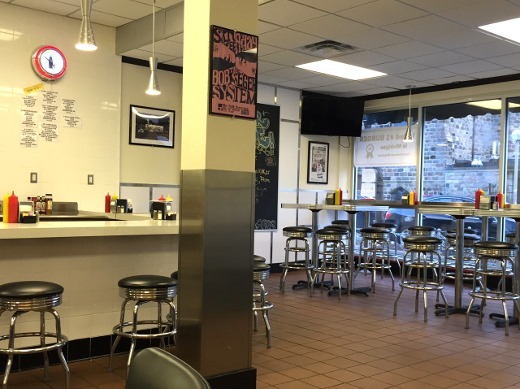 A couple weeks ago, we were in need of a quick and easy dinner near campus, and decided to try something new: Hunter House Hamburgers on William Street. 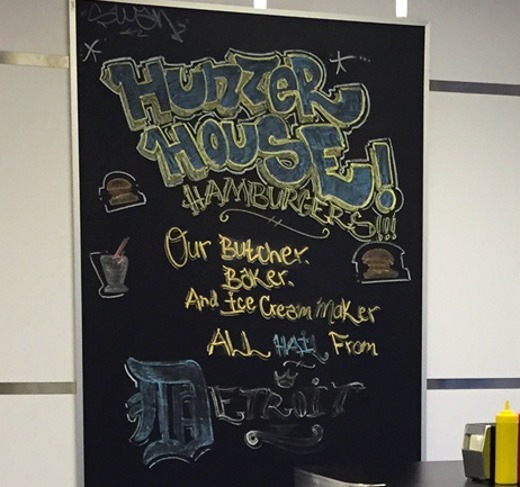 Hunter House is a family-run business that has been operating at their original location in Birmingham, MI, since 1952! Their new location is Ann Arbor is their second store. And as you can see, their “butcher, baker, and ice cream maker all hail from Detroit!” It’s always nice to support a small local business. The staff gave us a friendly greeting upon entering. We visited very earlier, like before 5:00 PM, on a Friday night (we are so old! ), so not too many people were out for dinner yet, but there is ample seating available, including a booth area along the back wall in which we were seated. 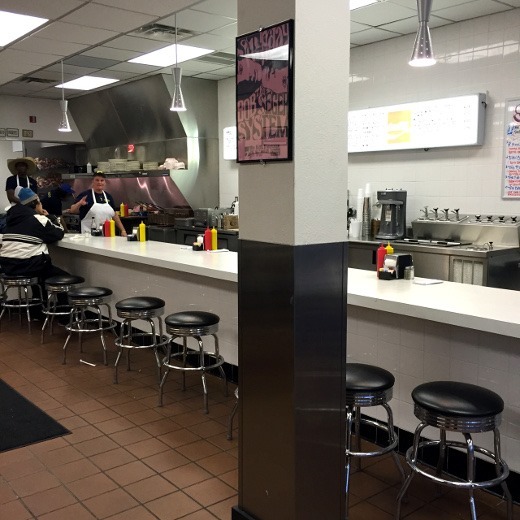 After ordering, we had a seat, and a member of the staff delivered our hot and fresh food with a smile. 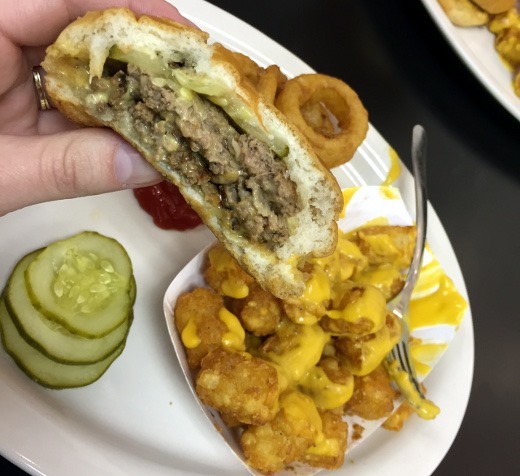 Hunter House is known for their original sliders, “a little hamburger with juicy, sweet onions smashed into the meat and the buns steamed hot,” as their website describes. Each of the slider patties are about 2 oz. each, so I ordered a triple cheeseburger, along with a side of tots with cheese. Helllllo! Hunter House absolutely delivered on their promise of a juicy burger, as this slider basically melted in my mouth. Though sautéed sweet onions are “smashed” into the patty, the onion flavor is sweet and subtle. I especially liked the soft steamed buns upon which the juicy beef patties were served. These delectable little patties need few, if any, toppings, as they already pack a lot of flavor on their own. 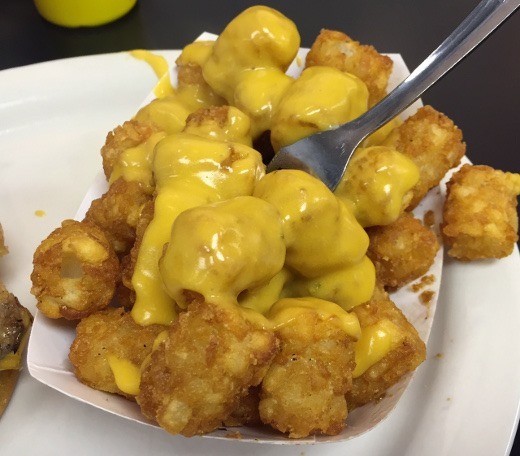 The tots were also great – super crispy on the outside, and slathered in my favorite guilty pleasure nacho cheese. The huz ordered the cashier’s recommendation for a solid meal: two double cheeseburgers. 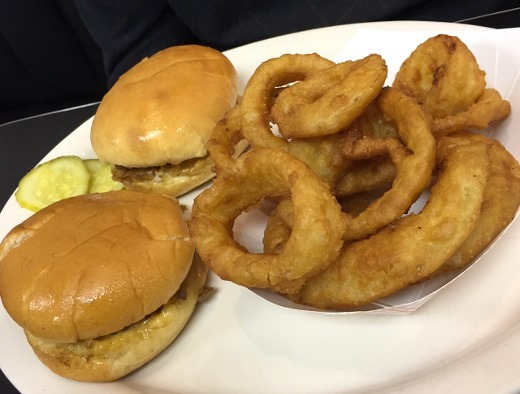 These have a more equal meat-to-bun ratio than the triple, as you might imagine, and he said this was a pretty filling dinner for him, especially when accompanied by an order of onion rings. 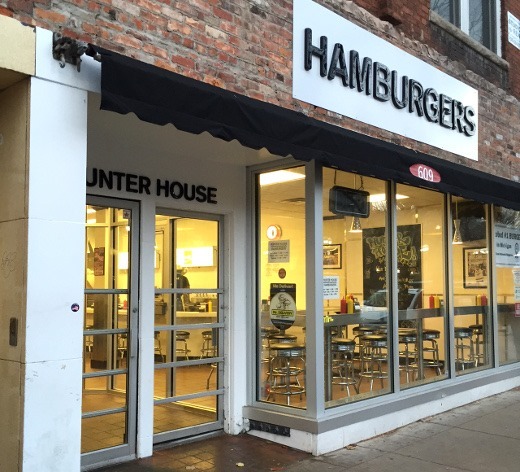 While there are plenty of burgers to be had around Ann Arbor, I think Hunter House’s defining characteristic is their burgers’ melt-in-your-mouth factor. Very crave-able. 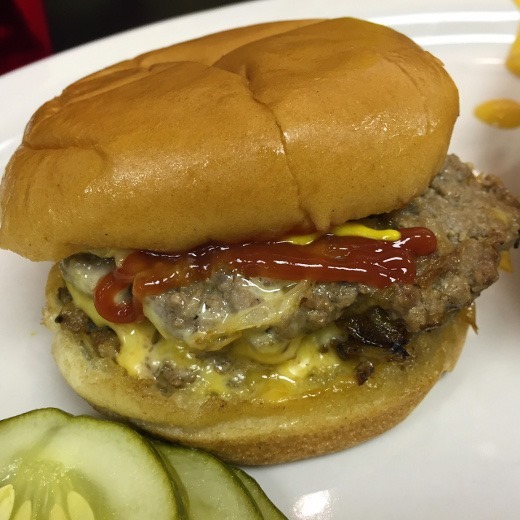 Worth checking out next time you have a burger craving, and you need a quick meal. I hear they have a large selection of milkshakes with custom fillings as well, which I have yet to try. Until next time! Wow The food looks delicious especially those onion rings ! Totally agree! 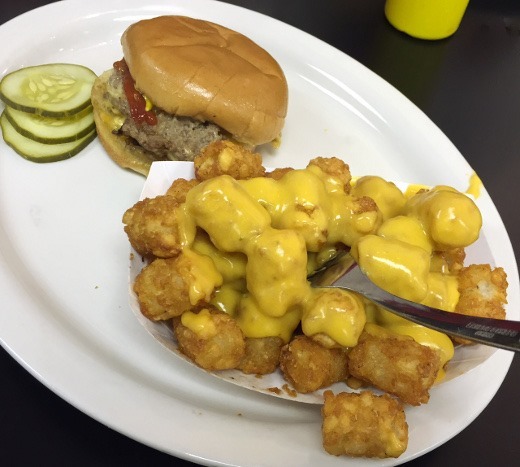 Tots + burger = solid combination. I think you just gave me a burger craving! Is tater tots really a thing in restaurants? With weird cheese on top? Tellme you’re making this up! Haha, they’re not super common, but I’ve seen them at a handful of places before! Those tots with cheese may be a game changer. Oh yeah, they were pretty luscious. I liked the tots better than the onion rings. This looks delish, and is making me hungry! Will have to check it out sometime soon!